Department of Biotechnology, Sir M Visvesvaraya Institute of Technology, Hunasamaranahalli, Bangalore- 562 157, Karnataka, INDIA. Background: Caesalpinia bonducella L. is a medicinal plant belonging to the family Caesalpiniaceae. It is a prickly shrub widely distributed all over the world especially in Indian tropical regions such as Kerala, Andaman and Nicobar Islands and Sri Lanka. 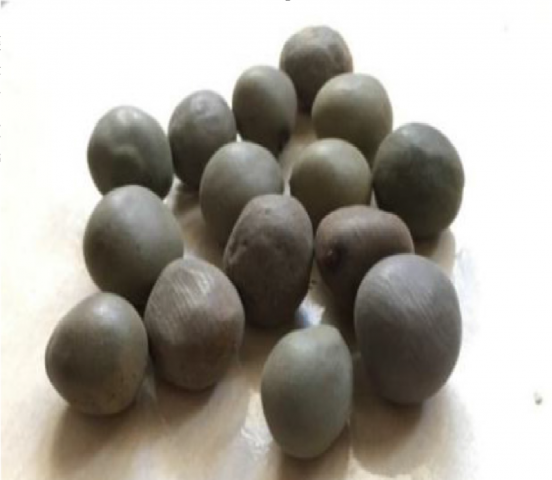 There are claims that its leaves or seeds/ seed kernel possess antipyretic, antidiuretic, antibacterial, antiviral, antiestrogenic and antidiabetic activities Due to the above properties several preparations of the plant were used in folk medicine. Materials and Methods: The aqueous extract of Caesalpinia bonducella nut containing the seed and the shell, has been evaluated for qualitative analysis of secondary metabolites (tannis, flavonoids, alkaloids, saponins, coumarins, quinone and phenols), in-vitro anti -inflammatory, anti-diabetic assay, antioxidant, antimitotic and antimicrobial activity. The studies were carried out using HRBC membrane stabilization, inhibition of alpha amalyse enzyme, DPPH method, green gram growth inhibition, agar diffusion method respectively. Results: Our results indicate the presence of Alkaloids, Flavanoids and Saponins. We report in our study the antidiabetic, anti-inflammatory, anti-oxidant, anti-microbial and antimitotic activity of Caesalpinia bonducella. Subbiah V, Nagaraja P, Narayan P, Nagendra HG. Evaluation of Pharmacological Properties of Caesalpinia bonducella Seed and Shell Extract. Pharmacognosy Journal. 2019;11(1):150-154.